Jay McNett started cutting hair back in the day when Piqua had a tavern on Main Street. The tavern, named Jay's, had a room inside for a barber shop. Jay ran the tavern and cut hair part time. Al Habiger cut hair full time. Eventually Jay sold the tavern and went to work full time for the Gates Rubber Company in Iola but cut hair on the weekends. When the tavern building caught fire and burned to the ground, the barbershop equipment was saved and moved to the corner of the Piqua Farmers Coop Farm store. It has been there ever since. When Jay retired he started coming in on Tuesdays from 7:30 a.m.-4:30ish. 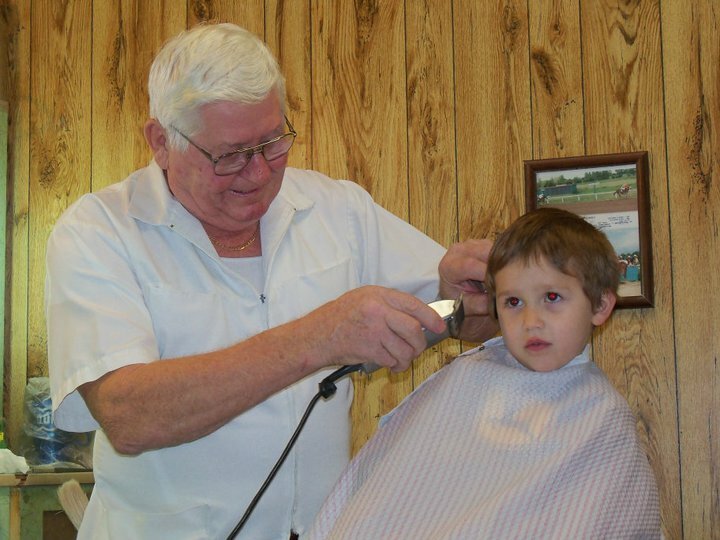 He has cut hair for four generations of Piqua folks! He charges $7 for a hair cut and nothing for the conversation! Another Fascinating Fact: Jay has been a heavy construction equipment operator for the past several decades and still does when he is not in the barber shop cutting hair.